Now that I don't have to work anymore, I really enjoy waking up in the morning. I love that feeling of knowing I have the entire day to do whatever I want, and I don't have to do anything I don't want to (well, other than exercise and household chores that is.) My absolute FAVORITE part of waking up is my morning brew! I have my little routine every morning where I drink my coffee and spend a few hours on the computer chatting with my on-line friends and blogging. I even have my special 'spot'; my husband and I call it 'Sheldon's Spot' because if someone else is sitting in that spot we say 'Your sitting in my spot' just like the character Sheldon does on 'Big Bang Theory'. It's just the perfect spot in our living room because I can put my coffee mug on the end table to my right. So, it's my spot. :) Of course, when my husband is home he thinks it's 'His Spot', and that's when the trouble begins. LOL! 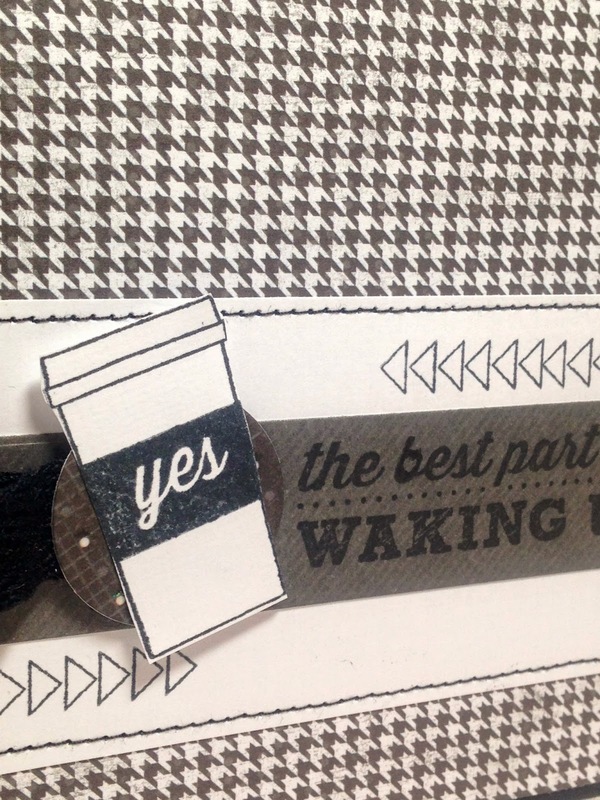 I made the card below for a man in our church who is also a coffee lover. This card actually has a cute coffee story to go along with it too. The man is on our worship team, and whenever we are scheduled to sing together, I always ask him to make the coffee because I'm terrified of our church's coffee maker. He bought the coffee maker, and has one of his own at home, so he knows how to make a pretty good cup of coffee with the contraption. He has thus become known as the official coffee maker of our worship team, so when his birthday rolled around, I made him a coffee card and wrote inside 'Happy Birthday to the Best Coffee Maker on the Worship Team'. To make my card I used a stamp set I won in the Coffee Lover's Blog Hop. Yay for free stuff! It is from Evalicious and is called 'Wake Up'. The paper is from DCWV 'Dots, Stripes, and Plaids. I used my sewing machine to stitch on the white panel. I popped the main image up onto a circle shape and added just a touch of ribbon behind it. The sentiment was stamped on a banner made from an MFT die. So what about you? Do you have any special spots in your house you like to sit? What are your favorite beverages? I'd love to hear from you! 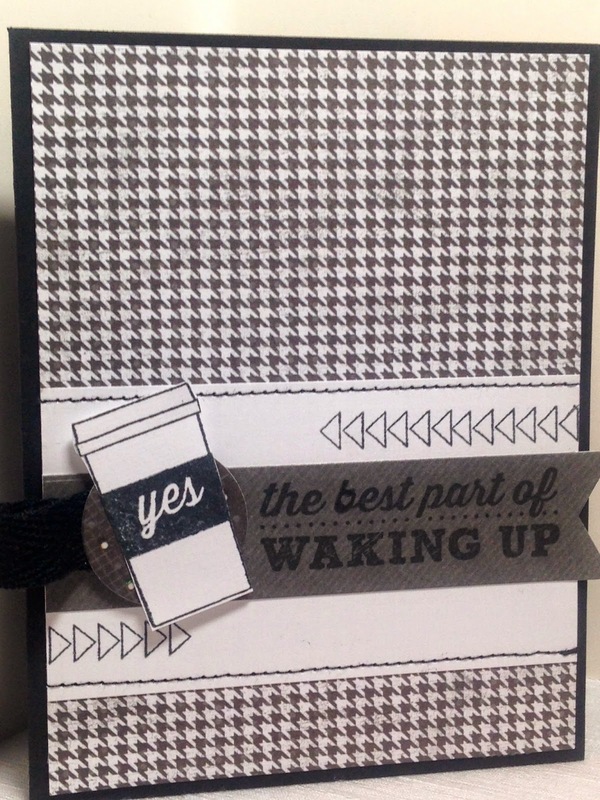 Fantastic card and perfect for a coffee lover and coffee maker :-) Congrats on winning the stamp set! Oh wow ! such a perfect card !